Stamping In Living Color: Brown Sugar Challenge Blog #206: Celebrating the fun and whimsical designs of Dr. Digi's House of Stamps! 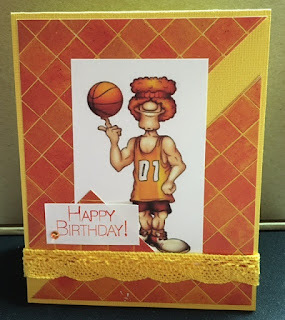 Brown Sugar Challenge Blog #206: Celebrating the fun and whimsical designs of Dr. Digi's House of Stamps! Hello, fellow stamping and card-making enthusiasts! I am pleased to announce my having been selected to the design team for the Brown Sugar Challenge Blog. My inaugural card features a really cute basketball player name "Slam Dunk Duncan." Isn't Slam Dunk a handsome fellow? He is delightfully colorized, so it only took a small amount of time to create a masculine card to feature him on. I used Bazzil cardstock, Colorways patterned paper by Paper House, and popped on a birthday sentiment and. I love when a masterpiece comes together! Dr. Digi's House of Stamps has a fun and creative assortment of digital images on papercrating projects.